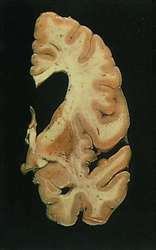 A rare inherited disease of the central nervous system characterized by progressive dementia, abnormal posture, and involuntary movements. The typical age of onset is between 30 and 50 years. Also called Huntington's chorea. a rare abnormal hereditary condition characterized by chronic progressive chorea and mental deterioration that results in dementia. An individual afflicted with the condition usually shows the first signs in the fourth decade of life and dies within 15 years. It is transmitted as an autosomal trait and becomes progressively worse in severity as the trinucleotide repeats grow in successive generations. There is no known effective treatment, but symptoms can be relieved with medication. Huntington's chorea Neurology An AD degenerative disease of adult onset–ages 40-50 that leads inexorably to death Clinical Slowly progressive mood and personality changes, mental deterioration, loss of coordination, chorea, cognitive decline, chronic fatigue, apathy Treatment None. See 'Escapee. ', Trinucleotide repeat disease. Huntington's disease is a neurodegenerative genetic disorder that affects muscle coordination and leads to cognitive decline and dementia. Clinical features of Chinese patients with Huntington's disease carrying CAG repeats beyond 60 within HTT gene. Identify and understand important and diverse types of therapeutics under development for Huntington's Disease. With the Huntington's disease domain knowledge that CHDI brings and the therapeutic approach that Isis is pioneering, this partnership has the potential to develop biomarkers for specific therapeutics for Huntington's disease and lead to personalized medicines for Huntington's patients. 7) The Huntington's Disease Society of America's (HDSA) A Physician's Guide to Managing Huntington's Disease includes recommendations for treating apathy based on clinical experience. While the trial had found a reduction in Huntington's disease symptoms after treatment with CoQ 10, the current research uncovered a 17% reduction in 8OHdG levels in Huntington's disease patients as well as a nonsignificant reduction in subjects who did not have the disease. The research by the Huntington's Disease iPSC Consortium examined several other cell lines and control cell lines to ensure that their results were consistent and reproducible in different labs. In these studies, bone marrow derived mesenchymal stem cells secreting neurotrophic factors (MSC-NTF), from patients with Huntington's disease, were transplanted into the animal model of this disease and showed therapeutic improvement. Diamond, a neurologist who is fellowship-trained in movement disorder with emphasis on Huntington's disease, was approved by the Huntington Study Group Credential Committee. The search for a cure continues, and people who carry the Huntington's disease (HD) gene may live decades before showing symptoms of the condition, advises Dr.
NORDIC BUSINESS REPORT-December 30, 2010--Danish Neurosearch presents positive results from Huntington's disease trial(C)2010 M2 COMMUNICATIONS http://www. APARENT with Huntington's Disease has a 50:50 chance of passing the serious, incurable and degenerative condition on to their children.